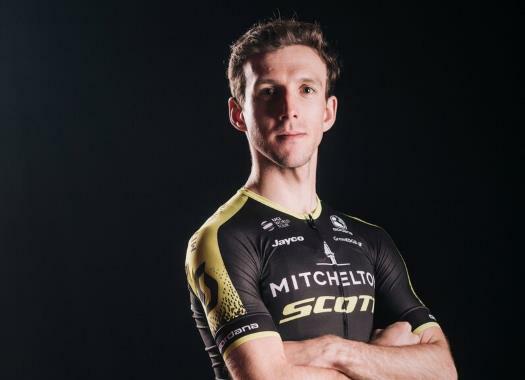 Simon Yates (Mitchelton-Scott) has taken the victory of the 14th stage of the Vuelta a España. The Briton attacked from the favourites' group at the last kilometre and crossed the finish line on his own. The second mountain stage of the second week of racing in the Spanish grand tour took the riders through a 171-kilometre route that featured one climb of the third category, one of the second and three first-category ascents, including the finish at Les Praeres. Ivan Garcia Cortina (Bahrain Merida), Brent Bookwalter, Nicolas Roche (BMC), Thomas De Gendt (Lotto Soudal), Michael Woods (EF Education First) and Michal Kwiatkowski (Sky) formed the breakaway of the day. The pace of the front was very high and soon left behind several riders until only Roche, Bookwalter and Kwiatkowski remained. With around 30 kilometres to go, there were splits at the peloton that left the race leader Jesus Herrada (Cofidis) struggling behind. Meanwhile, Kwiatkowski attacked in the front and continued by himself. At around 20 kilometres to go, Louis Meintjes crashed in one of the curves on a descent and came back to his bike, even though he looked injured and confused. At five kilometres from the end, the peloton caught Kwiatkowski as it prepared to face the last climb of the day. The first rider to attack was Steven Kruijswijk (LottoNL-Jumbo) and Richard Carapaz and Alejandro Valverde (Movistar) tried to catch him. With two kilometres to go, Simon Yates (Mitchelton-Scott), Miguel Angel Lopez (Astana), Nairo Quintana (Movistar), Thibaut Pinot (Groupama-FDJ) and Enric Mas (Quick-Step Floors) got to Kruijswijk. Quintana then changed the pace and took Lopez with him, and as the others came close, the Colombian of Movistar attacked again and was once again followed by the Astana rider. Close to the banner of the last kilometre, Yates, Pinot, Kruijswijk, Yates, Mas and Rigoberto Uran (EF Education First), joined the Quintana group and rode together for a few metres. At 800 kilometres to go, Yates attacked and built a gap while Quintana, Valverde and Lopez tried to close. Lopez changed the pace and Valverde followed him, while Quintana and Pinot stayed behind. Yates crossed the finish line seconds ahead of Lopez and Valverde. Pinot and Quintana were fourth and fifth to cross the line. Yates once again takes the Red Jersey.